Neil: Try it all together now. May I have a cookie, please. Sean: (Looking up wide eyed at his father, all earnest and nodding) Yes, you may. Some words from a woman I admire whole heartedly for her ability to write beautiful stories that echo gracefully of her faith - Madeleine L'Engle. "Artistic temperament sometimes seems a battleground, a dark angel of destruction and a bright angel of creativity wrestling." "In the evening of life we shall be judged on love, and not one of us is going to come off very well, and were it not for my absolute faith in the loving forgiveness of my Lord I could not call on him to come. " "Inspiration usually comes during work, rather than before it." 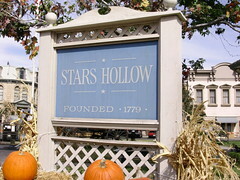 If only it was all real...I'd drive straight to Stars Hollow right now and have the Gilmores throw the movie night to end all movie nights, in a dedicated effort to go into a sugar induced coma and forget the past few days. In the course of this week, all three of my kittens have died. Sad, sad, sad MommyCat. And yesterday, I backed out of a parking space at daycare and hit another car. Yeah. Not my finest hour here, folks. Where's a Starlight festival and a crazy Kirk when you need them? What I was doing (and thinking) all day Saturday.